In the latest installment of our high-tech queries, TechShop CEO Mark Hatch discusses annoying reboots, the ka-chunk of classic tech and much more. The full gamut of answers -- from Leatherman to Siri -- await your perusal on the other side of the break. iPhone 5. It allows me to always be on. My Toshiba T1100 Plus running DOS 2.11 with a whopping 640KB of memory. Configured with a RAM disk and dual floppies... I was all that. In our segment I would have to say Autodesk clearly understands the potential of the maker movement, maker spaces and the future of manufacturing best. And they are putting money into the segment faster than any other company. I've always been partial to "Leatherman." Dell Inspiron IM5030-3413B3D... It makes the AS400 sound inspired. I live on email of all forms. Siri. And other voice-recognition systems. They're terrible. I used a voicemail service in the late '90s called Wildfire. It rocked. I call on Rich Miner at Google Ventures, who co-founded Wildfire, sold it and moved on, to resurrect it and save us from Siri. 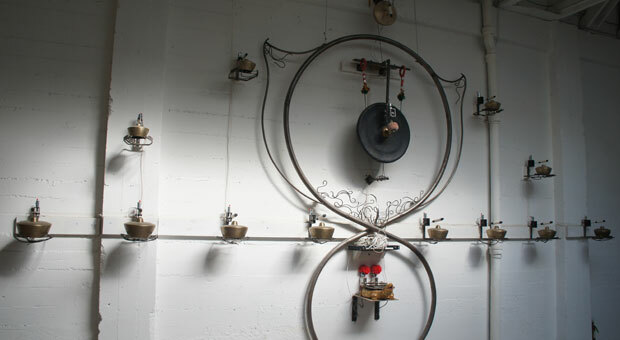 Aaron Kuffner's Gamelatron, which merges robotics and Balinese musical tradition, sits on display at TechShop SF. Some people forget how revolutionary visual voicemail was; for those of us who grew up on voicemail and getting stuck with 30 to 100 calls waiting... and no idea who called or why... or what urgency. Sox. Perfectly intuitive, allows for self-expression, easy to use and comfortable. Electro-mechanical TV channel changer. I loved the sound of the "ka-chunk," as the channel changed. I think electricity had the most profound change on the world. Radio technology up through and including RFID is as close to pure magic as we are likely to ever see (or not see). The first time a tech described RFID to me, I kept asking where the battery was. He kept saying it didn't need one. Huh? Devices with no power? "Radio technology up through and including RFID is as close to pure magic as we are likely to ever see (or not see)." I used to tolerate configuration and setup issues as just the cost of being an early adopter ... and then I started getting Apple products. Gadgets that have to be rebooted consistently drive me nuts. Somehow I now have a printer that has to reboot. Really? Shouldn't a printer just work? This is like asking, "When has your right hand been the most help?" I meet people, get deals done, plan trips, find the nearest hospital, locate a good restaurant. Gulfstream G550. But I would settle for a HondaJet. I think Samsung is headed in the right direction. The iPhone 5 screen is simply too small. Thankfully I now carry an iPad mini ... but it will not fit in any of my pockets. People who want and need to get to me can, and I can meet with people who I want or need to connect. I've never responded to an email while in the shower. I bought my first acoustic coupler around 1985. In 1991, I took a cruise to Mexico; I couldn't connect for two days. It almost killed me.